I use Walt Hampton’s Marimba books for Zimbabwe-type xylophone pieces. The kids LOVE them. Here’s one of them. This is a school in Zimbabwe with music and dance. I think it’s really fascinating and the kids learn so much from it! Dr. King, he had a dream, he had a dream for all you see. His name was Martin Luther King! On the board, I put this visual, erasing one letter after each verse! Works great! 1. We already know the song BINGO so this switch is not hard. 2. 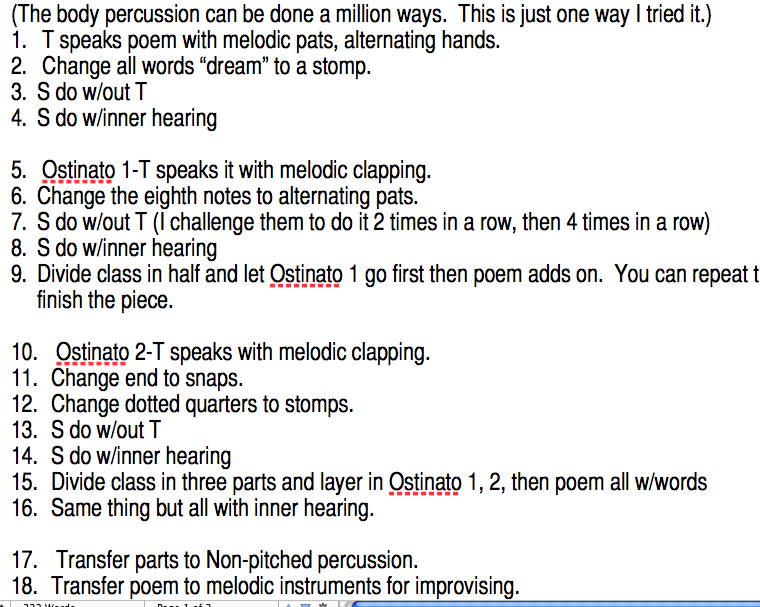 Once we sing it as a group, as a group we replace the clap with something else. 3. We take suggestions which usually are; snap, pat, stomp, hit our chairs, cluck our tongues, etc. We vote on which one we want to do and do the NEW sound/motion as a class. 4. The next class, partners or small groups choose a new sound/motion and then we sing as a class. There are so many fun possibilities. You can ask the groups to choose a motion, a sound, an instrument, a leveled motion (high, middle, low). 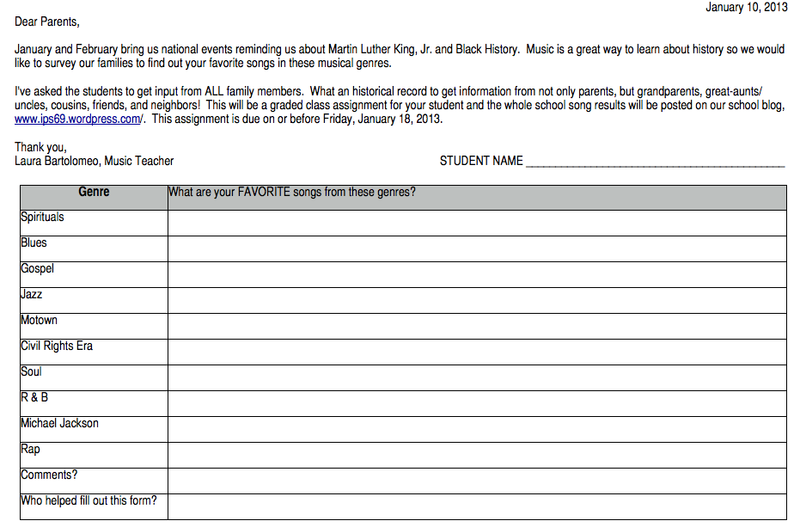 We have a Black History Celebration Concert every year and this year I want to get some song suggestions from the families of my students. Here is the survey I’m sending home. I always start the unit by putting up genre cards on the board in no particular order and have the students try to order them chronologically. My programs usually consist of songs from 5 or 6 of the genres. The results will be posted on our school Cultural Competency Blog! 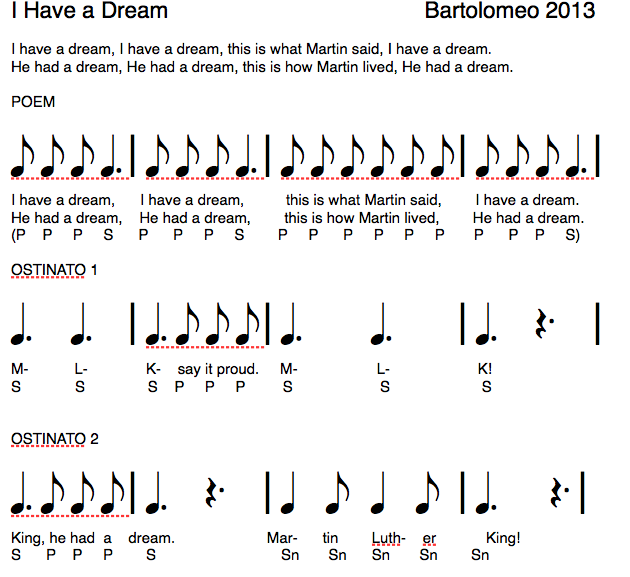 Simple Martin Luther King poem with ostinati! How do you teach about MLK? Please leave a comment to share.